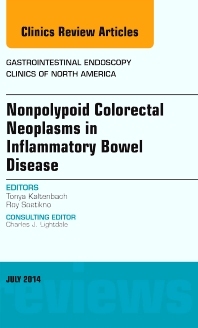 Dr Roy Soetikno and Dr Tonya Kaltenbach are the editors for this issue of Gastrointestinal Endoscopy Clinics of North America, which is devoted to the improved detection and management of early neoplasia in inflammatory bowel disease. An important aspect of Dr Soetikno’s outstanding career has been the bridging of endoscopic methods between Japan and the United States. Endoscopists in Japan have a better record of detecting subtle flat GI lesions. From the earliest days of endoscopy, it is fair to say that Japanese endoscopists have emphasized visual identification, analysis, and photo documentation of small GI lesions. The colon has been no exception. Dr Soetikno has incorporated these techniques, which have become increasingly feasible with steady improvement in modern digital endoscopes. Identifying small flat premalignant lesions and early cancers in patients with colitis can be lifesaving. Dr Soetikno and Dr Kaltenbach have edited an extraordinary issue of the Gastrointestinal Endoscopy Clinics of North America devoted to teaching and promulgating these methods, including an extensive photo atlas, which should be an invaluable resource for all academic specialists and practicing gastroenterologists.